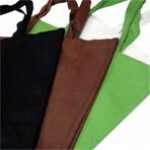 Our large canvas bags are suitable shopping bags with their large side gusset and flat opening base. Like our medium canvas bags, the large bags are available in the same 12 canvas shades, and are available from just 10 bags plain from stock. Printed bags can be ordered via our website click here large printed canvas bags. For larger quantities or bespoke colour requirements please can our sales team. Large Black Canvas Bags 400x138x340mm (width x height) Price per pack..
Large Natural Canvas Bags 400x138x340mm (width x height) Price per pa..